If you're a Subaru devotee whose family is too large for an Outback or Forester, the Tribeca is the logical choice. First-time Subaru buyers will find the Tribeca's good fuel economy, strong resale value and proven reliability very inviting. Very reliable car, spacey, and has all features that are needed such as GPS, aux cord, car charging, and seat warmers. Performance is very nice for an SUV however it is not gas efficient. Great service. Very dependable. Handles well in adverse road conditions. I love the ease of operating. It has a very comfortable ride. It is dependable and has great safety ratings! No complaints. Subaru is a trusted name to me. I love its all-road capability. It has loads of room for kids or hauling items. My only complaint is the small fuel tank. 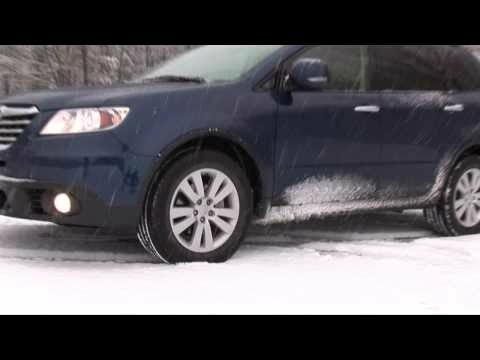 SUBARU HAS NOTIFIED NHTSA ABOUT A DEFECT IN CERTAIN MODEL YEAR 2010 TRIBECA PASSENGER CARS MANUFACTURED FROM SEPTEMBER 4, 2009 THROUGH MARCH 8, 2010. THE DOOR LATCH CABLES LOCATED INSIDE THE VEHICLE¿S DRIVER AND FRONT PASSENGER DOORS WERE IMPROPERLY POSITIONED DURING PRODUCTION. AS A RESULT, A CABLE CAN CATCH IN THE DOOR GLASS REGULATOR WHEN A WINDOW IS OPENED OR CLOSED. SHOULD THAT OCCUR, IT MAY UNLATCH THE DOOR, CAUSING IT TO COME OPEN UNEXPECTEDLY WHEN RAISING OR LOWERING THE WINDOW. IF A DOOR WERE TO UNLATCH, IT COULD OPEN SUDDENLY AND WITHOUT WARNING, CREATING A RISK THAT AN OCCUPANT COULD BE EJECTED AS WELL AS A RISK THAT THE DRIVER MAY BECOME DISTRACTED, LEADING TO A CRASH. THIS CONDITION MAY ALSO RESULT IN THE FAILURE OF A DOOR LATCH TO OPERATE, IN WHICH CASE OCCUPANTS WOULD BE UNABLE TO OPEN THE DOOR TO EXIT THE VEHICLE. SUBARU WILL NOTIFY OWNERS AND DEALERS AND WILL REPAIR THE VEHICLES BY REPOSITIONING AND SECURING THE LATCH CABLE IN BOTH FRONT DOORS FREE OF CHARGE. THE SAFETY RECALL IS EXPECTED TO BEGIN ON OR ABOUT MARCH 19, 2010. OWNERS MAY CONTACT SUBARU TOLL-FREE AT 1-800-SUBARU3 (1-800-782-2783) MONDAY THROUGH FRIDAY BETWEEN 8:30 AM AND 7:00 PM EST AND FRIDAY BETWEEN 10:30 AM AND 5:00 PM EST.